opportunity for liberty and prosperity to take hold in an important part of the world. Ambassador Salem Al-Sabah and I were inspired by this news, and we wanted to help. Along with the Kuwait-America Foundation, we decided to make Malaria No More the benefi ciary of our fourth annual gala dinner, “Stand for Africa,” which will be held on March 12 at our residence in Washington. To date, the foundation has raised more than $1.5 million for the cause. 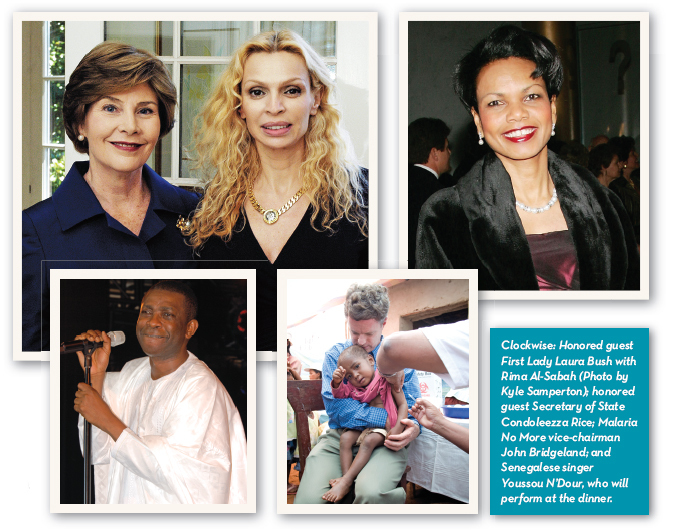 First Lady Laura Bush and Secretary of State Condoleezza Rice will be the honored guests at the gala; legendary Grammy award-winning Senegalese artist Youssou N’Dour will perform; and PBS’s Charlie Rose will serve as master of ceremonies. Soon, Malaria No More will lead the international health community in a 36-month plan to expand malaria control in Africa. This approach will combine the best practices of public health with the best ideas from the private sector. With the support of partners such as the Kuwait-America Foundation, this effort could save 3.5 million lives and increase annual economic output by as much as $30 billion in Africa over the next fi ve years. My husband and I take great pride in working with Malaria No More and advancing the promise of a malaria-free world. We envision a hopeful future; a future in which the children of Africa will no longer be condemned to illness or death from this disease but will live to develop their own potential and make their own contributions to society. With continued support, together we can make malaria no more.